Everyone who’s been somehow confronted with printing has heard about offset printing before. However, this does not mean that everybody understands how offset printing works, and what makes it so suitable for printing flyers, leaflets, brochures, posters, and basically any other print product in high volumes. First, some history and science. Offset printing refers to the printing process through which ink is indirectly applied from the printing plate to paper via a roller. Offset printing can be traced back to around the beginning of the 20th century, and is a direct technological development from lithographic printing which emerged in the late 1700s, and which used printing plates made out of stone. Offset printing takes advantage of repellence characteristics between water and lipids to print the desired artwork. In a nutshell, the printing plate (which carries the artwork template) is covered in part with a lipophilic (fat-loving) layer and in part with a hydrophilic (water-loving) layer. In combination with the use of fatty printing ink, this means that only the parts covered with the lipophilic layer will be covered in ink while the rest of the plate remains clear of ink. This way, the printing process reproduces exactly the artwork template. Now as we already mentioned, offset printing is an indirect printing process, meaning that the printing plate is not directly applied onto the final surface which in this case is paper. Instead, designs are printed on the paper through the intermediary of a rubber-covered cylinder set up between the printing plate and paper, which increases the printing quality. The indirect nature of offset printing justifies its name: the printing is set off... The advantage of this process is that it allows continuous, uninterrupted and very high speed printing at the highest of quality. In offset printing, one printing plate is required for each printing ink color, which means that there are a total of 4 printing plates per artwork, i.e. one for each of the four CMYK colors. The paper runs through all 4 plates successively and each color is printed on the sheet on top of the previous colors, finally forming the desired design and colors as per the pdf file. For a graphic visualization, see below. Offset printing machines are very large and expensive, both in terms of acquisition and maintenance, and their setting/adjustment takes quite some time. In addition, the creation of the printing plates for each print job is also quite costly. In other words, offset printing carries high fixed costs with it, and is therefore only worth it in medium-to-long print runs. However, variable costs are extremely low, and therefore the price-performance ratio of offset printing is literally unbeatable after a certain threshold quantity. Below that quantity, digital printing (a newer but lower quality process) is a lot more price-worthy. In addition to low cost for long print runs, offset printing is unbeatable from the point of view of speed and quality. Finally, a distinction can be made between sheet-fed and web offset printing. In sheet-fed printing, is typically used for medium-sized print runs where the artwork is printed on pre-cut paper sheets that are usually in B0, B1, or B2 format. On the contrary, web printing is suitable for very long-run newspaper, telephone book, or catalog printing because instead of relying on pre-cut sheets, it relies on large paper rolls which are cheaper and speed up the printing. Feeling satisfied about reading this blog post until the end? You should be! 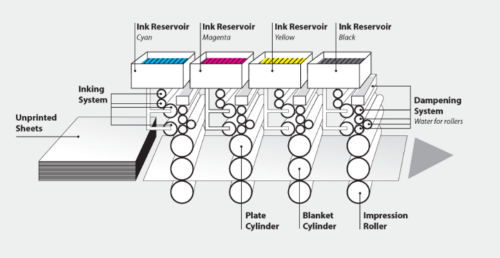 Now you know exactly what offset printing is, and how it works. Gogoprint relies extensively on offset printing, and on the highest quality offset equipment only, such as Heidelberg presses which are renowned worldwide for their quality. Introducing Human Resources Assistant Manager, Amelia!